On 31 May 2016 the local Council of Churches elected their representatives for the next four years. 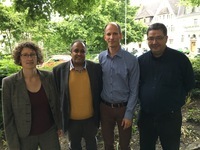 New are Pfarrer Stephan Gras (Roman-Catholic) as Chairman and Pfarrer Andreas Günther (Protestant, EKHN) as Secretary, while Deputy Chairman Yared Tsehaye (Ethiopian-Orthodox) and board member Dorothee Dziewas (Anglican/Episcopal) were re-elected and will continue their work on this ecumenical committee. The Wiesbaden Council of Christian Churches has its own website and facebook page. The website has information on all 16 member churches (in German only). The Council of Christian Churches in Germany (Arbeitsgemeinschaft Christlicher Kirchen) works on a national, a regional and a local level. 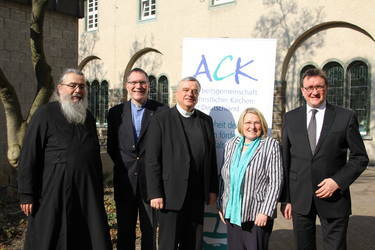 In Wiesbaden the ACK has 14 member churches, St. Augustine’s being one of them. Represented by our delegates, we are involved in ecumenical activities in the city, worshipping, celebrating and learning together about our faith.